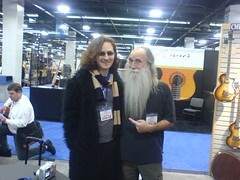 One of my favourite things about going out to NAMM each January is getting to see Lee Sklar – if you’re a bass player you obviously already know who he is. If you’re not a bassist, you might recognise Lee as the guy that played bass with James Taylor and Phil Collins who looks like the Farside version of God. He’s a bona fide bass legend, has defined how the rest of us approach playing with singer/songwriters, but has covered so many other styles, including playing on Billy Cobham’s classic fusion record, Spectrum. Interviewing Lee back in 99 was a real pleasure, and an honour, and since then we’ve become friends, and always catch up for a chat a NAMM. He’s on tour with Toto at the moment – if you go and see them play and get to say hi after the show, please pass on my best! here’s the interview – enjoy! Few faces are as instantly recognisable within the bass world as Lee Sklar. The same is definitely true of his playing. With more than 30 years and 2000 albums behind him, Lee’s sound has graced more hit records than almost anyone. Aside from being a hired gun, Lee is best known for his long standing musical relationships with Phil Collins and James Taylor. Indeed, it was the gig with James that proved to be Lee’s ticket into music full time back in the late 60s. “I was in a lot of local bands in LA, including a band called Wulfgang,” recalls Lee. “James auditioned as the singer but wasn’t what we were looking for – we needed someone somewhere between Sam ‘n’ Dave and Robert Plant! James blew me away but just wasn’t right. So was it working with James that opened the door to session work? Unlike many bassists, it’s impossible to label the one kind of music that you get called for – your CV is so diverse. How did that come about? Has that always been your approach? “When I got into the studio scene, I found myself getting all kinds of calls. One minute I’m doing Helen Reddy’s ‘I Am Woman’, and the next thing I know I’m doing ‘Spectrum’ with Billy Cobham. The calls would come in and I’d just look at everything as a challenge. Have you ever turned down a session? “Occasionally – I’ve had a huge amount of wrist injuries, so I can’t play thumb-popping (slap) style – I don’t have the dexterity to deal with it. So when people call me to do that, I put them in touch with friends I have – I’d rather see other guys working, and I’ll just come hang out. “I also don’t play upright anymore. I was doing a project where I was using a Washburn 5 string fretless to get an upright sound, but they had a couple of songs where they wanted real upright and I said ‘call Patitucci’ – it was when he was still living in LA – and I went down and hung out at the sessions with John. From a listener’s point of view, it sounds like you spot the holes, and never play across the vocal? I assume that that sets producers at ease? “Not only the producer, but I often get hired because the artist feels like they’re going to be comfortable with the extra room to breath. Guys get so used to ‘time’ that they don’t really understand that you can have a beautiful pause before a verse, because you’re human! Don’t do all your training with a metronome, try to understand what it is to really feel a song. Don’t be afraid to leave that kind of space. That’s what I’ve always liked about Asian thinking, the importance of space, allowing things not to be there. After so many tours and albums, do you still have any unfulfilled ambitions? In Defense Of REAL Musicians! After 30 years in the industry, having seen recording technology blossom from the days when a four track was state of the art to what we have now – how has that changed it for players like yourself? “Firstly, I’m all in favour of technology – I don’t want to be living in the stone age – but one of the biggest problems with technology is that it’s become so good that it’s allowed people into this business that should never have been in it. With Pro-Tools and such like, you’ve got singers that can’t sing to save their lives and engineers whose whole careers are spent tuning bad singers. You’ve got a drummer with no time, so you move the beat. As far as I’m concerned if the guy doesn’t swing, fire him – let him serve french fries in McDonald’s, but don’t let him get in a studio, because there are too many great players trying to get into that seat. That aspect of technology I find really disconcerting. 6 Euphonic Audio 2×8″ and 2×10″ speaker cabs. 10 GHS Super Steel Strings 40-102. It was a privilege to play with musicians that good – Corey, Robert, Shaney and Deborah are all incredible players, and delightful people, and I hope I get to play with all of them again v. soon! “Which only goes to say that we need filters. It doesn’t prove the monetary filters are the only ones, or even the best ones, but it does suggest that we need a way of making sure we doing overdose on junk-music. And of course, those filters are already there, and I use them. The two i use are Last.Fm and Emusic. Last.fm offers a few different services that can help you discover new music, as well as the option to listen before spending money… firstly, there’s the radio stations, stations that are digitally programmed according to your taste, the tastes of people who like similar things to you, or by the taste of people who happen to also be fans of a particular band, or use a particular tag, so the level of randomness in relation to your own recorded playlists is affected by which of those radio options you choose, and how much listening time you’ve logged. Still, it’s an amazing site, which provides purchasing links with all the artists, data for tracking live music details, tools for blogging about music, forums for connecting with music fans connected by musical or extra-musical interests and a host of other things to make researching music fun. Emusic is a very different formula, in that it is primarily a shop. The difference being that you ‘subscribe’ for a certain amount per month, and get a certain number of fairly high quality DRM free downloads for your fee. In my case, I get 50 tracks a month for £11.99 – which is about the standard price of a single CD in a specialist music shop. If you happen to like styles of music where the artists record long songs, you can get a heck of a lot of mileage for your money (for example, you could get almost all of the Jonas Hellborg back catalogue with 50 downloads, as few of his albums feature more than 5 or 6 tracks). This month, I’ve just downloaded John Patitucci’s latest album, ‘Line By Line‘ (which is playing as I write, and is excellent), Gary Willis’ newest project, ‘Slaughterhouse 3‘ (marvellous heavy avant-fusion), and a glorious Kenny Wheeler record called ‘It Takes Two!‘, which I can already tell is going to be become a huge favourite. 3 amazing albums I would have been unlikely to buy on CD, but which I found on emusic via review and recommendation. You see, every artist and album has links next to it to things listened to by people who like that. You also get recommendations via friends and again via digitally compiled lists of users with similar data to your own. The option is there to listen (though the M3U playlist system used to preview music is clumsy and a pain in the arse), or you can just download a couple of tracks and see how you get on. Both great filters, highly recommended. if you want to find me on either of them, at last.fm my listener page is here and my artist page is here. For emusic, my listener page is here and the place for downloading my music is here. I really like the emusic model for downloading and paying for music – you’re paying a fraction of the cost of what you would for a CD, but you’re also committing to a certain level of investment each month in the ongoing success of recorded music. Everybody Wins! In my time at Bassist, I interviewed John Patitucci twice – once was the one below, backstage at the Barbican, and once was for a jazz tutorial piece, downstairs at Pizza Express on Dean Street. He was a player that was talked of in such revered tones when I was at college – the pinnacle of wikkid bass skillz, and, I think, the first person I ever noticed playing a 6 string bass (when he was interviewed in Guitarist mag in the late 80s) – The bass line and solo on ‘Got A Match?’ from the first Electrik Band album was pretty much the gold standard. He was a nice guy to interview, friendly and full of great answers, and clearly someone who thinks in a very deep way about his playing. This interview followed his second really great record – ‘Now’. The first, ‘One More Angel’ is one of the finest acoustic jazz records of the last 35 years, IMHO, and came after years of impressive but relatively hollow electric fusion records.